Internet casino players are transported back to the Seventies – and all the groovy music, funky fashion, and dizzy dance moves for which the era is so fondly remembered – in the Disco Inferno video slot. The five-reel video slot, which features 20 optional paylines, is clearly inspired by disco, funk and soul music and films like “Saturday Night Fever”, “Flashdance”, and “Stayin’ Alive”. The Disco Inferno soundtrack certainly plays that funky Seventies music, with toe-tapping slap base riffs, trumpets, saxophones, and the like keeping the rhythm going as the reels spin. In terms of visuals, the brightly coloured Disco Inferno slot features a host of theme-appropriate symbols, including a glittering disco ball, a silhouetted dancer doing the disco finger move just like Travolta, an illuminated disco dance floor, and more. Also featured are the regular playing card symbols, 10, Jack, Queen, King and Ace. Behind the Disco Inferno reels, characteristic Seventies artwork resembling a bright red and orange sunset is displayed. 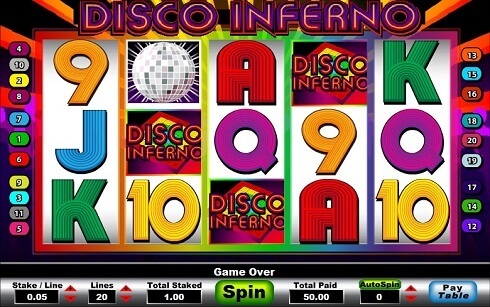 In order to play the Disco Inferno slot, players must wager at least one coin of 0.01 credits on at least one of the game’s 20 paylines. Braver players can go all in with the largest coin value of 25.00 credits for a max bet per spin of 500 coins. What are they playing for? The top prize in Disco Inferno is 10 000 coins, which is paid out for five wild symbols appearing on a single active payline. The silhouetted dancer is the Disco Inferno wild symbol and he is extra special in this game because, in addition to standing in for all symbols except the scatter to help create wins, the Disco Inferno wild comes with another perk. That is, the Disco Inferno dancer shimmies across to replace an adjacent symbol so one wild on the reels is really two wilds on the reels. In addition to activating free spins like most scatter symbols do, the Disco Inferno disco ball multiplies the wins that it creates. Disco ball symbols pay out for three or more symbols landing anywhere on the reels. Over and above the multipliers they award, three or more Disco Inferno disco balls also present players with up to 250 free spins at Canadian online casinos. When three such scatter symbols are landed, Disco Inferno players are taken to a new screen to play the game’s bonus round. Here, they must choose between 16 different vinyl records to reveal a prize. If they don’t like the prize offered by their chosen Disco Inferno record, they can reject it and choose again – but they can’t go back to a previous offer once they have rejected it.